As your lawn grows it produces a layer of thatch, just above the soil. Thatch is made up of living, dead and decomposing plants. If the thatch layer becomes too thick the soil beneath can become compacted and it will make it difficult for the roots to grow. 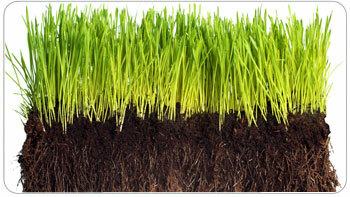 It will also limit the movement of air, moisture and nutrients through the soil. Thatch can provide a home for insects and diseases in the Durham Region. The best times to dethatch in Ontario is late spring and early fall. However, grass should be actively growing before dethatching the grass. In addition, the lawn is prepared for dethatching by mowing it to about half of its normal size. Many DIY’s in the Greater Toronto Area opt to dethatch their own lawn, but be forewarned that the process is physically challenging specially for the inexperienced gardener. In many cases, it is normally recommended to have a professional dethatch your lawn for you. Professionals use dethatching equipment that removes thatch by using a series of knife blades that cut into the thatch layer. The blade removes the thatch by pulling it out of the lawn. Once the thatch is removed from your lawn, the thatch needs to be raked up immediately. In the Durham Region, a desirable thatch thickness is ½” or less. Unlike aerating, leaving some of the cores to break down on their own is appropriate; in dethatching, thatch must be raked or removed right away. Once the lawn is dethatched, this is a normally a good time to fertilize the lawn. Keep in mind that dethatching will cause stress to your lawn. It is important to ensure that the lawn is well cared for after dethatching process.